You don't have to be a seasoned shopper to know where to buy a good, inexpensive digital camera. Cheap point-and-shoot cameras are practically everywhere. The key to scoring a top-rate bargain digital camera is patience and timing. Cheap doesn't necessarily mean bad. In today's market, you don't have to drain your bank account to purchase a high quality digital camera. Advances in technology have given way to a seemingly endless supply of affordable digital cameras that don't require compromising quality for price. Inexpensive digital cameras are not loaded with the same amount of features as higher priced versions. However, you will still be able to snap quality images in normal shooting conditions. If you are on a budget, consider sticking with reputable brands such as Kodak and Canon. Kodak: Kodak's EasyShare line of point-and-shoot digital cameras offers outstanding features for little money. The affordable collection is especially popular among beginner photographers, who are looking for high resolution, zoom capability and auto focus. Canon: Canon is a proven leader in the industry and their collection of budget digital cameras do not disappoint. The brand's PowerShot A470 is one of the best sub-$100 cameras around. The unit features excellent resolution, a large LCD, and stylish exterior. With so many cheap point-and-shoot cameras on the market, the question you should be asking is not where to buy a good, inexpensive digital camera, but where can't you buy a good, inexpensive digital camera.You can find a seemingly endless supply of decent quality digital cameras for great prices at major retailers and online. Home electronic stores, such as Best Buy and Fry's often put discontinued models on clearance. There is a chance you can score incredible savings on quality digital cameras if you time your shopping trip just right. Amazon.com: The popular online retail site is considered one of the best places to snag amazing deals on quality digital cameras. 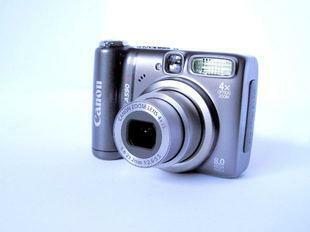 The site features nearly 500 new and used digital cameras listed at less than $50. Amazon also offers free shipping and doesn't charge sales tax. BH Photo Video: BH Photo Video is the world's leader in photo equipment sales. The New York-based company has a stock that is unmatched by the competition. In addition, the site offers first-rate products at attractive prices. Bargain sites: Internet bargain sites such as Fatwallet.com and Slickdeals.net are also great resources for affordable digital cameras. The sites allow people to post deals they have found online or in retail stores. It is a good way to check for unadvertised sales and other bargains. Local camera stores, photography clubs and photography-related online forums are also great resources for finding inexpensive digital cameras. They are especially good places to find photographers who have upgraded their equipment and want to sell their old cameras. Often you can find digital cameras at a fraction of the retail price.Newspaper classified ads and the popular online site Craigslist are also good places for scoring excellent deals on new and used digital cameras. However, the downside of purchasing used photo equipment online is that you don't have the opportunity to personally inspect the camera before buying.